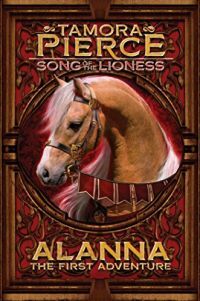 Alanna: The First Adventure by Tamora Pierce is the story of young woman named Alanna who decides to train to be a knight. The problem is that she needs to disguise herself as a boy since girls are not allowed to be knights. This is a fantasy book targeted to teens and as such I am not exactly the demographic the book is written for. The story was very familiar to me as I have also read the entire Protector of the Small series also by Tamora Pierce. My problem is that I enjoyed the Protector of the Small series more than Alanna: The First Adventure. The stories are so similar with young women disguising themselves to become knights that I didn't find much new in this story. If you enjoy stories about young people that mature into great heroes you will find something to like in Alanna: The First Adventure but I would tell you to check out First Test instead. I give this book three out of five stars.